aLegendWai: Here is my idea. You may agree or disagree. My advice is to abandon the 5 W stones and make a exchange (Your 5 W stones will not be wasted. Trust me :D). Black is strong in the upper side, so it is no good to struggle. Let Black takes the upper side. White takes the left side (and I think white should have friendly stones in the bottom part, right?). W may play a later on (when it is mature). White a is a probe move. If black hanes from outside, live in the corner. If black hanes from inside, escape and the 5 W stones should help W from keeping B to attack freely. W may consider b too. If B hanes on the right (ie c), B should be able to live. If B hanes on the left (ie d), then extend to the left. That's my idea. Feel free to comment. If you give up those five stones, you've given black at least a 40-point side, and the compensation I see doesn't look like 40 points worth, though it obviously depends on what the left side looks like. What you're suggesting isn't probe-like thinking. In probe-like thinking, you would Probe the corner before you decide to sacrifice the stones. 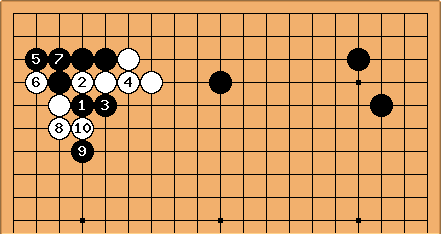 If black hanes inside and protects the corner, sacrifice the stones and leave the probe move as Aji to reduce or invade the side. If black protects the outside with an extension or hane, then you could save the stones and black would still owe a move to go back and protect the corner. If we did what you suggested, black would be happy to emphasize the outside and let you live in the corner with your invasion. Below I've shown a likely continuation from your suggested move. It would likely be a mistake for black to hane instead of extending at 1, because then black could crosscut and try to make sabaki on the outside. Now black has a 60+-point side and you have a small corner. aLegendWai: Thanks for your idea about the probe. I completely agree with you. But I think you misled that the probe is immediately played (sorry that my words are that unclear). I just show some more follow-up moves later on. The probe move is one option. By the way, when B choose to hane from the outer, W may decide not to finish all moves and plays elsewhere. Then the W corner stone(s) can be a threat when W attacks the side. Ar! Also even if B hanes from the outer, W may decide not to live small in the corner and cross-cut B.
aLegendWai: PatrickB, relating the strategy of abandoning the W group, I may be distracted by the statement (made by kokiri). The statement (5 Nov) is I ended up having to make life for two weak groups while black tried to escape with his centre stones. This makes me assume saving 2 groups is a burden unfavorable to W. After longer pondering, it seems W may manage to keep both groups live without helping B too much (because the middle B group is not safe either, it won't launch attack so freely). Anyway let's assume the whole-board situaton unfavors W to escape. This only keep W busy with saving both groups (because my suggestion is more or less based on this assumption). You said the discard of W group is worth 40 points. I think you do not mean B can gain 40 points after the capture. To me, B gains about 19-20 points in capturing W only. I think you are talking about the Deiri value or the value of difference on this capture. Even so, I beg to differ. The capture looks very large, but not indeed.